Carr Calls for an Assessment. Around the World for 84 Days. While the second crew set new records for productivity in orbit, the third crew spent long days in Houston's simulators. Bean and his colleagues had enjoyed first priority in using the limited training facilities until they left for the Cape. Only toward the end of July, with just over three months remaining before scheduled launch, did Carr's crew have uninterrupted use of the trainers. Besides practicing rendezvous, dock ing, and reentry procedures-tasks which took up most of their time- they rehearsed extravehicular activity in Huntsville's big water tank, sat through hours of simulations at the ATM console, and familiarized them selves with the 50-odd pieces of experiment hardware they had to operate. As if this were not enough, mission planners and experimenters devised more tasks for the last crew. After looking at early results, astronomers asked for new solar observations. Medical experts required extra measurements and photographs. Planning for these new experiments was sometimes faulty; the crew would later complain that training for some of them had been totally inadequate. Late in the summer, Headquarters program officials determined to use Skylab as a platform for observing a comet discovered by a Czech astronomer, Lubos Kohoutek, in March 1973. Its early discovery, nine months before perihelion, gave astronomers more time than they normally had to prepare for observing a comet (see app. F). Since the newcomer would swing around the sun in late December, Carr's crew would be in an excellent position to observe it.1 Using Skylab for comet-watching meant that new, complex maneuvering procedures had to be added to the training schedule. Removing the first of eight damaged stabilization fins from the Saturn IB that would carry the third crew to Skylab. 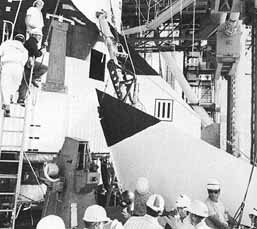 The work delayed the launch five days, until 16 November 1973. 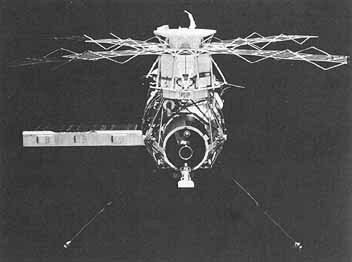 73-H-1105. The first week's big event was the extravehicular activity scheduled for 22 November, Thanksgiving day, when Pogue and Gibson would reload the ATM cameras and check out the inoperative antenna on the  microwave sensor. The latter job might be tricky, since there were no restraints on the under side of the multiple docking adapter where the antenna was mounted. But having worked out the procedures in Huntsville's big water tank, the astronauts were confident it could be done. Flight controllers and CMG experts, meanwhile, were learning the limits of their maneuvering capability with two control moment gyros. A symmetrical bow-wave cloud pattern downwind of small, mountainous Gough Island in the South Atlantic. The island itself, lower right, is clear. The photo was taken with a hand-held 70-mm Hasselblad camera. SL4-137-3632. We told the people on the ground before we left that we were going to take it slow and easy on activation, . . . that we were not going to allow ourselves to be rushed. We got up here, and we let ourselves just get driven right into the ground. We hollered a lot about we were being rushed too much, but we did not, ourselves, slow down and say "to heck with everything else"; and do things just one after the other, like we said we were going to do. Comet Kohoutek as photographed through the white-light coronagraph, experiment S052. 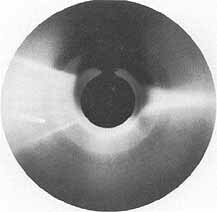 A coronagraph creates an artificial eclipse so that relatively dim objects near the sun can be seen. Here the comet is passing behind the sun, 27 December 1973. High Altitude Observatory photo. The astronauts were not the only ones who felt they needed a frank exchange of views. Robert Parker recalled that ground personnel too were inhibited by the open communications channel. No one who spoke directly to the crew ever suggested that they were doing less than a great job. "We just very seldom [found] ourselves capable of calling a spade a  spade," was the way Parker put it. It got worse when the newspapers began to suggest that the third crew was slower and more error-prone than the second. Everyone in Houston became defensive about the crew, feeling that they were being maligned.50 Not without reason did Carr call for some "straight words" from Mission Control. Bags of trash were deposited in the trash airlock, which had been the liquid-oxygen tank on the S-IVB stage. Toward the end of the third mission, some encouragement was required-which Pogue is prepared, left, to apply. Holding onto the ceiling, he is about to jump on the hatch, so that Carr will be able to insert the remaining bags. S-74-17304. 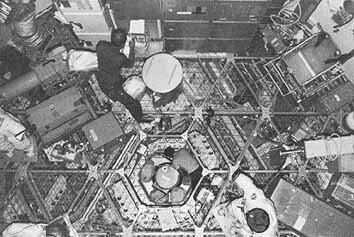 Below, an unusual view inside Skylab. The photographer is near the hatch into the airlock module looking the length of the workshop. The crewman in the center, seen through a passageway in the floor, is stashing trash bags. Two spacesuits and the third crewman are visible on the upper deck. SL4-1505061. The mayor medical experiments continued right on through deactivation, and there were a few experiments left to clean up on 4 February. Carr ran some zero-g flammability tests-put off until the end of the mission because exhausting the residues to space created contamination. The effect of gravity on flame. In a gravity field, the hot gaseous products of combustion rise by convection, allowing colder air with additional Oxygen to enter and mix with the fuel. 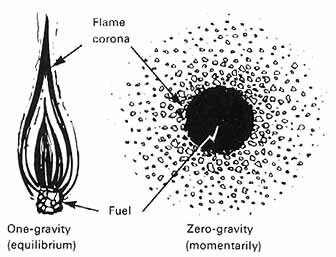 Without convection, a flame's corona is spherical and the available oxygen is quickly used. The flame dies down until more oxygen becomes available. Experiment M479 studied this phenomenon. 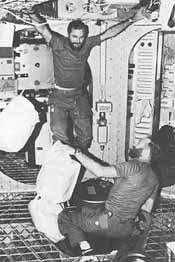 On 8 February 1974, Carr, Gibson, and Pogue moved into the command module and prepared for separation. The subsequent return to earth was normal, with one exception. Parting view. 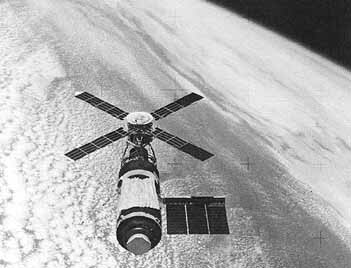 The third crew has undocked for the trip home, Skylab would circle the earth for five more years. 74-H-96. Two views of Skylab taken by the third crew on the final fly-around inspection. Left, a sun's-eye view of the telescope mount. The lines extending left and right from the hub of the mount are discone telemetry antennas. SL4-143-4676. Below, SL4-1434706. In both pictures, the corners of the original parasol are visible on both sides of the twin-pole sunshade. 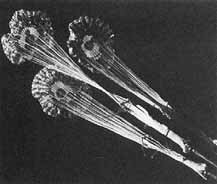 Welcome sight to tired astronauts: the three main ring-sail parachutes deployed at about 3000 meters to slow the command module as it approached the water. SL3-114-1760. 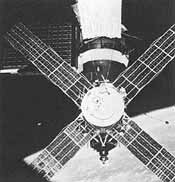 As soon as the crew had departed, engineers tested the batteries in the main power system, assessing how much they had deteriorated in orbit. They unloaded and reloaded the ATM's computer memory, something that had not been necessary during the missions, and found that the system worked perfectly. They tried unsuccessfully to start up the dead control moment gyro, then switched off the power to the other two, measuring bearing friction as the wheels ran down. As best the experts could tell, inadequate lubrication was responsible for the failure of number one and the near-failure of number two. On the afternoon of 9 February flight controllers maneuvered Skylab into an attitude stabilized by the gravity gradient, with the docking adapter pointed away from the earth, and shut off the power. 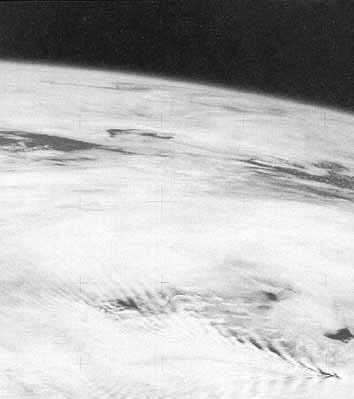 79 After the cigar ashes were swept out, Mission Control was quiet. i During the second mission, Mission Control had relaxed a long-standing rule and allow someone other than CapCom to speak directly with the astronauts. ii Gemini 8 brought back early because of technical problems, landed far from the primary recovery zone, where TV coverage had been planned. iii Scientists hypothesized that intraocular light flashes observed on several Apollo flights were caused by cosmic rays expending their energy in the retina. Earlier observations on Skylab, however, suggested a correlation with the South Atlantic magnetic anomaly, and Pogue's experiment was done in the hope of confirming that. Strapped in his sleep restraint, he noted the time, direction' end shape of the flashes. He found an abundance of events occurring in the South Atlantic anomaly, and the cosmic-ray hypothesis had to be reexamined. E. A. Hoffman et al., "Visual Light Flash Observations on Skylab 4 " Proceedings of the Skylab Life Sciences Symposium, August 27-29, 1974, NASA TM X 58154, pp. 287-95. In contemporary terminology, the unmanned launch of the cluster was called Skylab 1, the manned missions Skylab 2, 3, and 4.